Shop Tama LGB1465 SLP G Bubinga Snare Drum from AMS with 0% Interest Payment Plans and Free Shipping. This 12 ply 10mm Bubinga shell gives the Tama SLP G Bubinga Snare Drum an extraordinarily punchy sound with a large helping of low end. 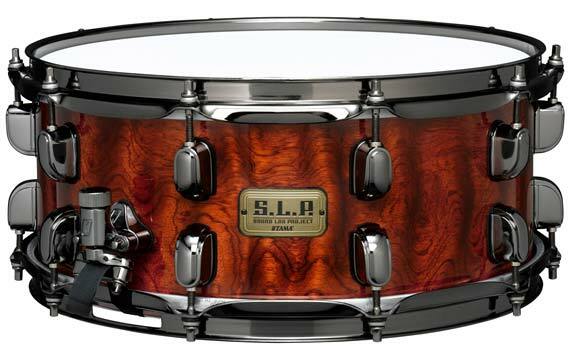 The combination of 2.3mm flanged hoops and low mass separate lugs allow the Bubinga shell to resonate more naturally. Best 'all around' drum for any musical genre. Great snare drum! Well worth the money. I’ve accumulated a small arsenal of snare drums over the years and wasn’t really looking for another until I saw a picture of this drum online. Just had to have it, so I bought it. The sheer beauty of this thing is captivating, not to mention the sound. The bubinga wood is a very unique and distinct sound. It didn’t take long before becoming my ‘go to’ snare. Compliments all around from my band mates, especially our sound man. Lovin’ this drum. Beauty, sound, and craftsmanship. This snare has it all! Best snare i’ve ever had and I’ve had a lot of them. Great snare. You can use this on just about any gig. I highly recommend this item. I have this with a Maple. Can’t go wrong with this snare! Cuts through PA system. Sounds really good tuned down or up. I have this one and the S.L.P. Black Brass. For the money, you can't beat the sounds you can get out of the S.L.P. line. Tama has hit a grand slam with this snare drum! This is my first Tama snare, and won't be the last. The sound, quality, construction & visual appeal of this snare are a great buy for the price point compared to other similar wood shell snares. Highly recommend this drum to all drummers regardless of the primary type(s) of music played, as it can be easily tuned from low to high to meet individual preferences. Out of the box with a quick tune and this drum sounds great!! I replaced the batter head with a evans genera dry. Really like the sound. Throw off is super smooth. And did I mention it's beautiful! I am collecting the Tama SLP snare drums and this is one that I have been lusting over for the past year and I finally purchased it and when I was unwrapping the drum I was amazed at how "BEAUTIFUL" the drum looked! It looked like a fine crafted piece of furniture. Very seldom do I play my new drums with the stock heads that come with them but I was preparing for a rehearsal so I could only tune the drum and play it immediately. I was thoroughly impressed with the sound qualities of this instrument. One word came to mind as I was tweaking and trying out the snare at different tensions and that is "BODY" As I tuned it medium to high I could feel my 2's and 4's in 4/4; my 4's in 6/8; and my 4's and 7's in 9/8. This drum has "CHARACTER" and I believe it could the primary snare in any genre of music. Also, I was impressed with the sensitivity of the snare at diverse volumes.I thoroughly glad that I added this drum to my compilation of snares!